When I look at this map, I wish a few words were bigger: business, value-adding, variety. However, I think they are growing! Developed, is past tense. I wish to continue to develop and innovate more and technologies and resources. Problem-Solving; I feel like that is under-represented. Seismic and scholarship seem to be disporportionately large, but I guess I will have to grow other words to catch up with them. 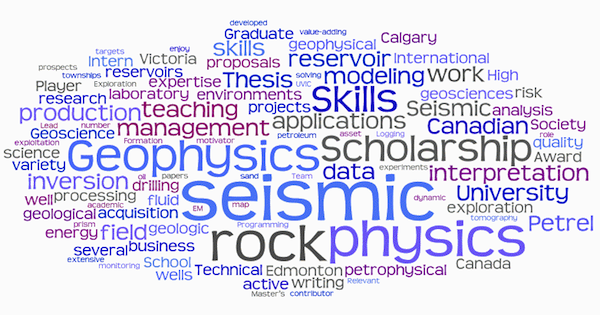 This word cloud has omitted places where I have done geoscience; Offshore Australia, Central Alberta, Athabasca Oil Sands, Finland, North Sea, Atlantic Canada. Words missing altogether; enthusiastic, creative, resourceful, a little geeky?